Have you noticed that Google today is celebrating UC alumna Dr Beatrice Tinsley? Dr Tinsley isn’t well known, but she should be! She was an astrophysicist whose work was significant in determining the size of the Universe and its rate of expansion. She graduated from UC with a Master of Science with First Class Honours in Physics in 1961. She then went and worked in the USA. During her short 14 year academic career, she authored or co-authored around 100 scientific papers on the evolution of galaxies. She was also the Professor of Astronomy at Yale. Tragically, Dr Tinsley passed away from cancer at age 40. 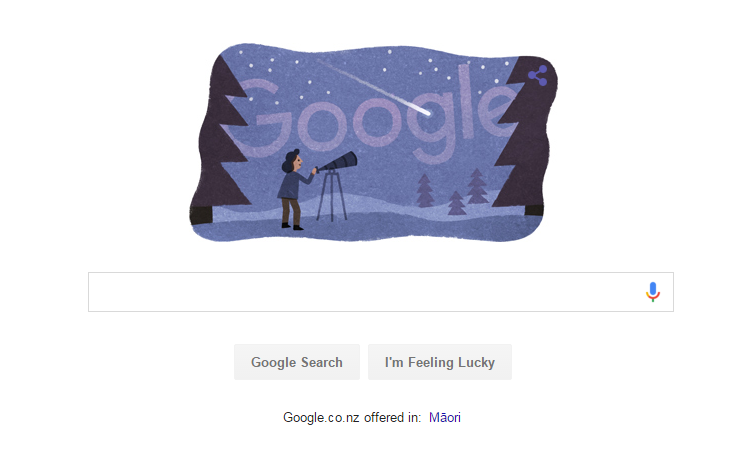 Today would have been her 75th birthday which is why the Google Doodle is about her. We honour her as a UC legend – look for her on the brightly coloured murals around campus. Undergrad students wanted for research! Are you an undergrad student? This survey is being undertaken as part of my main study toward PhD at Victoria University Wellington. The purpose of this study is to examine the effectiveness of health communications regarding binge drinking prevention. Victoria University of Wellington ethics approval has been obtained for this research (Ref: 21449). The results from this study will improve understanding of social marketers and public health administrators to motivate and prevent people from undertaking binge drinking. If you have any questions or require any further information please contact: Nguyen Hoang Sinh (SinhHoang.Nguyen@vuw.ac.nz). Outward Bound applications now open! Outward Bound is New Zealand’s leading organisation for showing people their full potential through outdoor challenge and adventure. Discover your full potential through a life-changing adventure in the outdoors. Push your limits and challenge yourself in a whole new way. Together with your team, you’ll tramp, climb, kayak, run and sail your way through some of the most amazing places in New Zealand, forming life-long friendships along the way. If you would like to apply for one of the three scholarships up for grabs, please download the application form from the UCSA Facebook post, email for the application form from Ee-Li Hong, the UCSA Advocacy & Welfare Manager, or come and grab a copy from Ee-Li at UCSA. The course runs over 3 time periods, 5-25 June, 4-24 July and 31 July-20 August. We will let you know by Tuesday the 22nd of March if you are the lucky punter. You will need to pay the $500 by the 7th of April to take up the scholarship. All submissions need to be in with Ee-Li by 9am Friday 4 March 2016, and if you have any further questions please address them to ee-li.hong@ucsa.org.nz.